Nearly one-third of U.S. households (31%) reported facing a challenge in paying energy bills or sustaining adequate heating and cooling in their homes in 2015. According to the most recent results from EIA’s Residential Energy Consumption Survey (RECS), about one in five households reported reducing or forgoing necessities such as food and medicine to pay an energy bill, and 14% reported receiving a disconnection notice for energy service. Households may also use less energy than they would prefer; 11% of households surveyed reported keeping their home at an unhealthy or unsafe temperature. The 2015 RECS asked about these and other challenges, including paying energy bills and repairing broken equipment in the home. Households experiencing these circumstances, often considered components of household energy insecurity, may be making difficult financial tradeoffs about which basic needs to fulfill. The 2015 RECS questionnaire captured both the occurrence of household energy insecurity and the severity of household energy insecurity in 2015, measured by the frequency of energy insecure events lasting anywhere from a few weeks to most of the year. Occasionally, households may lose the use of heating or air-conditioning equipment entirely. This situation can occur when equipment breaks and a household cannot afford to fix it or when a household cannot afford fuel for their equipment. Seven million households (6% of the national total) reported the inability to use heating equipment because of financial constraints at some point in 2015, and 6 million (5%) households reported the loss of air conditioning. These issues occurred during a year when the overall energy-related expenditure level was at its lowest point in more than a decade. 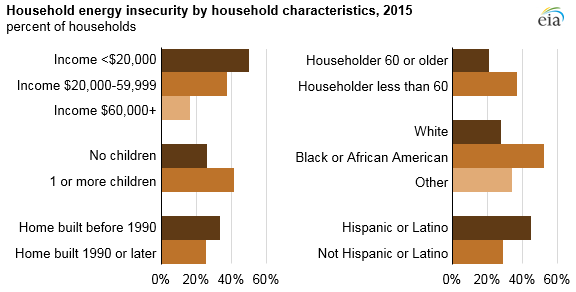 For instance, households that included children, that had residents who identified with a minority racial group or as Hispanic, or that were classified as low income experienced more energy insecurity. Households experiencing energy insecurity were also more likely to live in homes built before 1990. Additional information on household energy insecurity and energy usage in all homes is available in the 2015 RECS reports, tables, and a public-use microdata file.